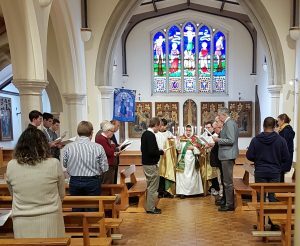 For some years the Schola has provided a team to support the Young Catholics Association (YCA) annual autumn weekend retreat, lately at Douai Abbey. This event has become a minor gem in the Schola’s year. Some of our regulars were unavailable, but back came one who was away in 2017; we provided seven – just enough. This was one of the first assignments of Iain Simcock, the Schola’s new director. Previously organist at Westminster Abbey and Assistant Master of Music at Westminster Cathedral, more recently he was organist at the Abbey of Saint Pierre in Solesmes. Iain’s style grew on us, interspersed with his reminiscences and pithy summary of how Solesmes came to the rescue of the chant. We missed Julia and Jeremy White, the latter rehearsing in Holland, but it is not easy to get rid of opera singers. One YCA member, Matúš Tomko is a Slovak opera singer whose bass voice lent a firm foundation during our psalms. From the Church Conservatory in Bratislava, his repertoire includes Mozart, Verdi, Bizet and Smetana. The Schola’s first rehearsal left your correspondent wondering if we had enough in the team. But far more YCA members than in previous years came to the second rehearsal; our combined contingent suddenly became a strong force and so it remained with the Schola outnumbered by eight YCA members who kept their toes still stuck into the water until the very end. During the weekend we sang Compline, Vespers and for two Masses. The first Mass for Our Lady’s Nativity was ‘High’ in the Extraordinary Form; Canon Poucin ICSK celebrated with Brother Deacon Greener OSB and Fr Lawrence Lew OP acting as subdeacon. Canon Poucin sang the rarely used Tonus Solemnior for the Preface. Growth? During this weekend we had both change and growth. Join us next year? The limit is how we can arrange overnight accommodation, but even that can be solved – given notice… If you want to be invited contact John Curran, JPCSedate@aol.com or 01509 852259 (calls welcome until 8pm- grumpily after then).